VS1 cycle shelter suitable for all types of locations including schools and shopping centres. The complete cycle shelter provides a safe and secure area for people to lock up their bicycles outside their workplace, school, shopping center or park. The designated secure area this cycle shelter offers not only provides safe storage of bikes, but it also protects them from the elements. 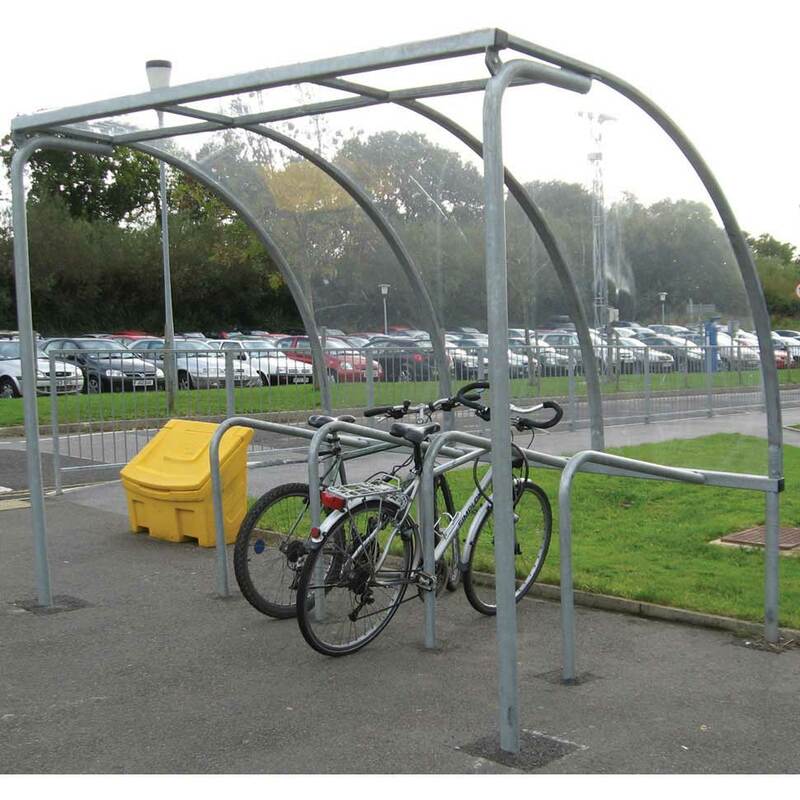 The cycle shelter comprises of 64mm tube with 60mm box sections, the framework has been fully galvanised to prevent corrosion and increase the life of the product. You have the option to have adjustable feet or concrete in fixings, this entirely depends on where you wish to install your cycle frame. 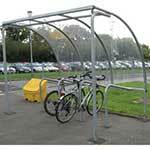 This complete cycle shelter also features a roof that is made of 5mm thick transparent PET sheet, preventing rain and wind from reaching the bikes. The complete cycle shelter comes as a starter bay which includes four integrated cycle stands, this is suitable to secure eight bikes. If you need to accommodate a larger number of cycles then there are extensions available. Each extension bay also has four cycle stands. For easy on site assembly the complete cycle shelter is delivered to you in component form making installation straight forward. Although the complete cycle shelter comes in a galvanized finish as standard, painted versions available on request, please contact us for more details.